The Saturday Review, 12 février 1898. The Academy, 19 février 1898. Revue de Paris, 1 mars 1898. The Spectator, 26 mars 1898. Revue Encyclopédique, 1898. Par Roger Marx. ’Huysmans’ The Cathedral.’ Par W L Courtney. Réedité dans The Development of Maurice Maeterlinck and other sketches of foreign writers, publiée par Grant Richards en 1904. 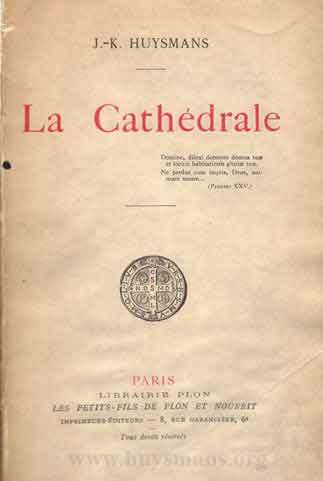 The Quarterly Review, ’The Cathedral in Fiction’, une essai comparatif par W H Hutton, publée en avril 1923.